CHW is proud to announce the promotion of Daniel Young, P.E., to Director of Engineering, Land Development. 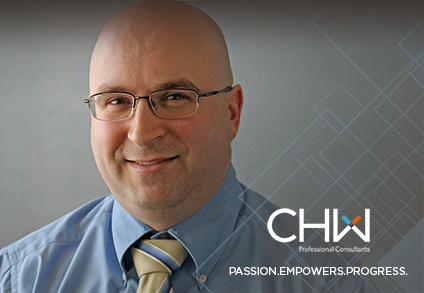 Daniel has been with CHW for 8 years and has 13 years of Civil Engineering experience in wastewater collection and water & fire distribution modeling and design, roadway design, site layout, and project permitting. Working both in the Public and Private sectors. Daniel has provided engineering expertise to prominent projects such as the University of Florida New Baseball Stadium, Nanotherapeutics Bio Manufacturing Facility (now Oculus), UF Health/Shands Medical Office Building Phase II, and many commercial retail, and mixed-use projects. For more information on our Engineering, Land Development team, visit our engineering page.